I’m in Austin. New to the group! Hello aantony4. 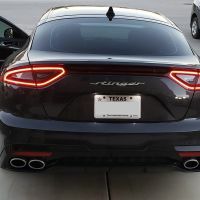 I live near Austin too and have been wanting to buy an exhaust for the Stinger. Do you still have it installed on your vehicle? I am wanting to hear it in person outside and inside the cabin before purchasing one because I have heard mixed reviews on the drone sound and loudness. Thanks Spider. Occasionally I see a ceramic silver color Kia Stinger GT passing through Buda, Texas. Any of yall him? If you are ever in the houston area let me know we have a couple of Stingers with aftermarket exhausts. Nice, H-town is my hometown and I'm always going down there.